FORWARD Florida’s mission is to educate both internal and external audiences to the economic development opportunities in Florida. Stories address key industries across the state, including transportation, real estate, sports, health care, education, entrepreneurship, tourism, the environment and technology, among others.We offer a menu of services, from advertising to social media, to graphic design/marketing collateral and custom publishing, to web design and video. Interested in trading services or working with us on a creative project? Provide a product to be featured in a giveaway. Working together on social media and sharing content. Submit your work as a guest writer. Queries should include your pitch, a description of your credentials and sample pieces. Please contact Susan Revello at susanr@forwardflorida.com. We also provide customized packages. 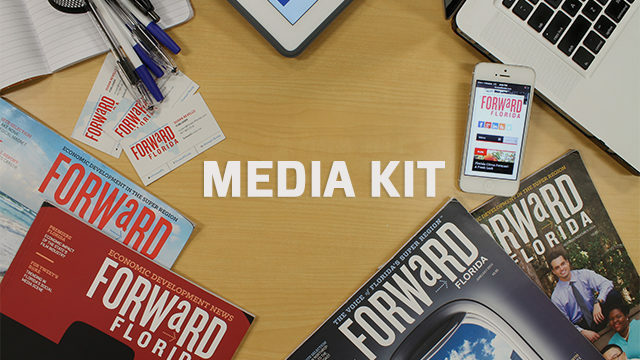 For more information and pricing, download our media kit. Sponsored articles or videos are available to be featured on forwardflorida.com. Content may be provided by sponsor or the FORWARD Florida team. Advertisements/promoted posts can be shown on one or more of our social media platforms. Or host your brand for a limited time through a Social Media “takeover” on our social media platforms.